Digital impressions for single crowns and fixed partial dentures have reported a high rate of success. This encourages some manufacturers to put great effort into the development of an intra-oral scanner to record hard and soft tissue morphology for the fabrication of a removable partial denture. 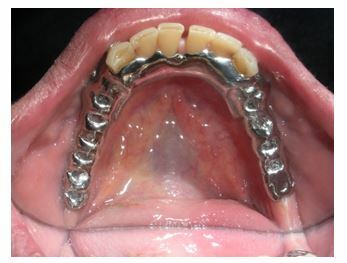 The evolution of the CAD/ CAM technology decrease the duration of prosthesis manipulation and provide superior functional and esthetic outcomes. Also changes of the prosthesis volume and/ or shape is reduced or eliminated in this approach compared to the conventional procedures. Thus the produced prosthesis adheres tightly to the tissue and uniformly transferring loads on it.6 Furthermore, it permits easy duplication of the denture and manufacture of new one using stored digital data. The main benefits of introducing CAD/CAM in the fabrication of RPD framework involve automatic determination of a proposed path of insertion, the immediate elimination of undesirable undercuts, and the equally rapid identification of desirable undercuts. Not only is it a time saver, but also the CAD/CAM technology delivers inherent repeatability, which may assist in decreasing human errors and enhance quality control in the dental laboratory. The CAD/CAM production of RPD framework based on two different processes: subtractive techniques (milling) or additive techniques. Subtractive manufacturing depends on milling the product from a block by computer numerical control machine (CNC). The subtractive procedures are greatly adapted to the fixed prosthesis. On the other hand, due to increased manufacturing time, complexity of the framework, material cost and wear, their implementation is more difficult for the production of RPD framework. 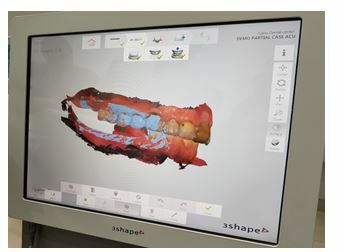 Basically, the manufacturing of RPD framework using CAD/CAM and RP, starts with preparing dental casts using conventional or digital impressions. The casts obtained from conventional impression are scanned using digital scanner. Then, Path of insertion of the RPD is determined by the software, Followed by 3D designing of the framework components. Finally, digitally designed partial denture frameworks are produced with RP. Rapid prototyping technologies (RP) include stereolithography (SLA), selective laser melting (SLM), selective laser sintering (SLS), selective deposition modeling, fused deposition molding (FDM), 3D printing and direct inkjet printing. 3D printing is a unique rapid prototyping technique that offers relatively low cost of machines and materials than do the other techniques and integrate with CAD software and other digital files. Currently, it is used in the fabrication of RPD frameworks by two main methods: One is to print firstly a sacrificial pattern in wax or resin materials which is then cast to metal frameworks, the other is the direct manufacture of metal frameworks by SLM technique. Direct manufacture of RPD framework is still of high production cost as well as its requirements for the property of printing machines and materials. Since, the most persistent complaint about mandibular distal extension RPDs was related to its retention 26, therefore this study was conducted to evaluate retention of RPD produced by new technologies to that of conventional RPD. 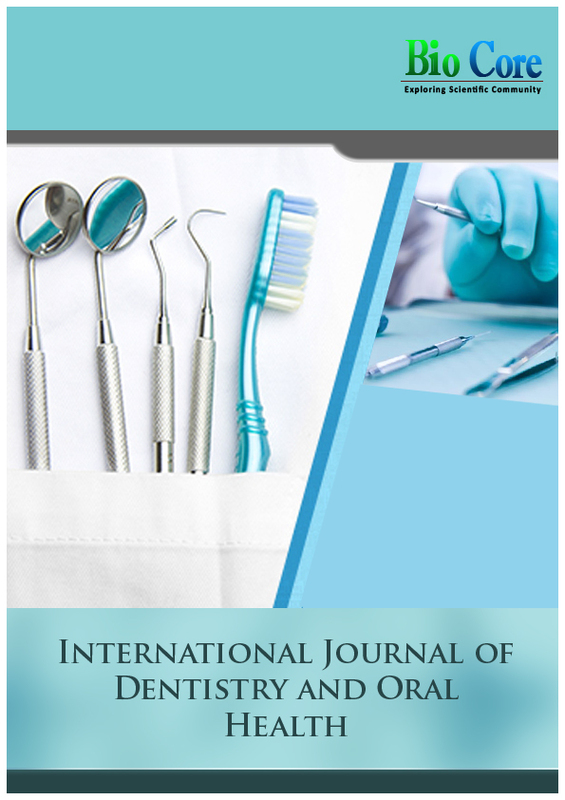 Twenty partially edentulous patients (11 women, 9 men, mean age 58.4 ± 8.3 years) were selected from the outpatient clinic of Modern Science and Arts University (MSA), Faculty of Dentistry, Egypt, to participate in this study. All patients having mandibular Kennedy class I with all posterior teeth missing. Detailed descriptions of the study were explained to each participant who signs a consent form. All participants are able to maintain adequate oral hygiene and clean their prostheses. They did not have major systemic health problems that may interfere with general oral health. The ethical principles of the faculty of dentistry Research Ethics Committee, October University for Modern Sciences and Arts were followed (approval reference: E T H 1). Then, the entire framework design was built virtually in 3D format and the different components of framework were added (Fig. 3 A, B).The standard triangulation language (STL) file was then transferred to a 3D printer (Rapid shape D30, Germany). This professional 3 D printer uses a digital light processing technology (DLP), a process similar to stereolithography (SLA). A HD resolution DLP projector , using a LED light source to photo cure liquid resin, layer by layer to build a 3d resin framework pattern of the RPD. The polyamide physical model was also obtained using the same 3D printer . (Fig 4) The 3D printed materials were post cured in UV curing unit ( L C 3 D print box , NEXTDENT UK) by U V light treatment . The printed resin pattern of the digital RPD is then invested and casted into cobalt- chromium framework using conventional casting technique. Metal try in of the framework was performed to check the fit and accuracy (Fig 5). All laboratory procedures were performed by one technician at the same dental laboratory. RPD were completed in the usual manner. At the delivery visit, prosthesis adjustments were performed and the patients were motivated to perform oral hygiene measures. Measurements were performed for each RPD at the time of denture insertion, after one month and three months later. Measurements were carried out using digital force gauge which is an advanced type of force meter device, used to measure tension or compression up to 20 Kg. Lower denture retention is most accurately measured by pulling the denture in vertical direction from its geographic center. This center was located on the duplicate mandibular cast by drawing four lines on the cast and extending them to the cast base in the following sequence; Line (1) connecting two points at the apices of the retromolar pads of both sides of the arch. Line (2) passing through the incisal edge of lower central incisors of the anterior ridge and parallel to the line (1). Line (3) passing through the mid line of the cast and perpendicular to both lines (1) and (2). On line 3, the midpoint between line (1) and (2) was determined and marked, (point a), which is the geographic center of the lower denture. Line (4) passing through point (a) and running parallel to lines (1) and (2). The measurements were performed while the patient was sitting in an upright position with his head rested on the head rest and the lower occlusal plane parallel to the floor. The metallic probe of the digital force gauge was attached to the metallic hook which is attached to the geometrical center of the mandibular partial denture (Fig 6, 7). 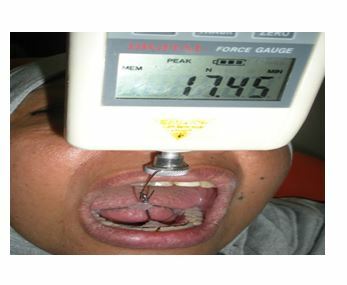 The force gauge pulls the mandibular denture vertically upward until denture movement occurs. The force at which the denture dislodges was recorded in Newton. The process was repeated until three readings were taken and the average was recorded. Data were collected, tabulated and statistically analyzed. Measurements were taken for each group by digital gauge force-meter where used Newton (N) as a unit measure. Mean and standard deviation were calculated for further statistical study. Exploration of data in table (1) revealed normally distributed values using Kolmogrov-Smirnov normality test as P-value > 0.05. Using independent t test for comparison between both groups regarding retentive values, there was significant difference between both groups at different follow up periods as (P value < 0.05), listed in table (2). After mean change percentage calculation, one way analysis of variance (ANOVA) was performed to calculate the significance between different time intervals for each group followed by multiple comparisons using Tukey,s post-hoc test concluded that there was significant difference between different intervals for each group as (P-value < 0.05) except for group II as it was insignificant different between (insertion-three months) and (one-three months) intervals, listed in table (3) . The mean retention values for digitally fabricated partial dentures recorded higher values than those of conventional dentures with statistically significant difference between both groups. This finding was also supported by a recent in vitro study evaluate the fit of cad cam manufactured one piece RPDs and concluded that their fit were better than those of traditional RPDs. Also these results were in accordance with another recent study by Wang et al, who fabricate RPD framework from a sacrificial pattern by SLA. They examined the quality of fit of both the sacrificial pattern and the casted framework and they found that it was subjectively estimated to be excellent. Furthermore, The results of this study was also supported by Malara et al., 2015 who found that The prosthesis which produced by CAD/CAM technology, adheres tightly to the tissue enhancing its retention, stability and transferring loads equally on the tissue, causing less interference in the oral mucosa. 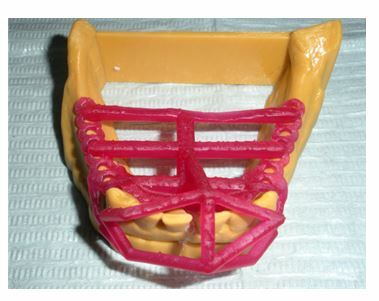 Within the limitations of this short-term clinical study the retention of digital RPD fabricated with digital impression, digital designing and casting a 3D printed pattern was higher than conventional RPD as it was associated with less human intervention. Vanzeveren C, D’Hoore W, Bercy P, Leloup G. Treatment with removable partial dentures: a longitudinal study. Part I. J Oral Rehabil 2003; 30:447-58. Zlataric K, Celebic A, Valentic-Peruzovic M, Jerolimov V, Panduric J.A survey of treatment outcomes with removable partial dentures. J Oral Rehabil 2003; 30:847-54. Abuzar MA, Kahwagi E, Yamakawa T. Investigating oral health-related quality of life and self-perceived satisfaction with partial dentures. J Investig Clin Dent 2012; 3:109-17. Wismeijer D, Tawse-Smith A, Payne AG. Multicentre prospective evaluation of implant-assisted mandibular bilateral distal extension removable partial dentures: patient satisfaction. Clin Oral Implants Res 2013; 24:20-7. Wu JH, Yang YH, Wang CH, Lee HE, Du JK. Effects of denture maintenance on satisfaction levels of Taiwanese elderly using removable partial dentures: a pilot study. Gerodontology 2012; 29:458-63. Persson AS, Oden A, Andersson M Digitization of simulated clinical dental impressions: virtual three-dimensional analysis of exactness. Dent Mater 2009; 25:929-936. 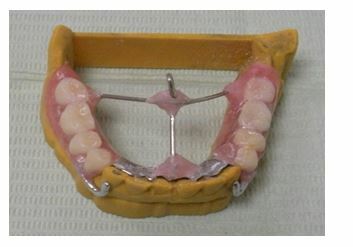 Williams R, Bibb R, Rafik T. A technique for fabricating patterns for removable partial denture frameworks using digitized casts and electronic surveying. J Prosthet Dent 2004;91:85-8. Williams R, Eggbeer D, Bibb R. CAD/CAM in the fabrication of removable partial denture frameworks: a virtual method of surveying 3-dimensionally scanned dental casts. Quintessence Dent Technol 2004; 2: 268-76. El-Khamisy NE, Habib AH, El- Mekawy NE, Emera RM: Digital versus Conventional Design For Mandibular Distal Extension RPD: A Study of Passivity of RPD Components and Principal Abutment Alveolar Bone Height Changes M. J. D. 2017; 4:6-13. Malara P A,. Dobrzański L.B, Dobrzańska J.B: Computer –aided designing and manufacturing of partial removable dentures. J. Achiev. Mater. Manuf .Eng.2015; 2: 157-164. Campbell S D ,Cooper L F , Craddock H :Removable partial denture : The clinical need for innovation. J Prosthet Dent 2017; 3:273-280. Han J, Wang Y, Lü P: A preliminary report of designing removable partial denture frameworks using a specifically developed software package. Int J Prosthodont 2010; 23:370-5. Williams RJ, Bibb R, Eggbeer D, Collis J. 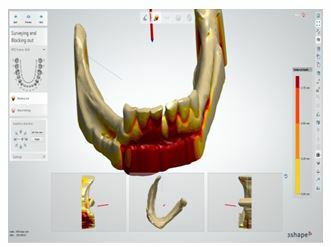 Use of CAD/CAM technology to fabricate a removable partial denture framework. J Prosthet Dent 2006; 96:96-9. Sun J, Zhang FQ. The application of rapid prototyping in prosthodontics. J Prosthodont 2012; 21: 641-4. Webb PA. A review of rapid prototyping (RP) techniques in the medical and biomedical sector. J Med Eng Technol 2000; 24: 149-53. Rahmati, S., Farahmand, F. and Abbaszadeh, F. Application of rapid prototyping for development of custom‐made orthopedics prostheses: an investigative study, Majlesi J. Mech. Eng., 2010, 3: 11‐16. Santler, G., Karcher, H., Gaggl, A. and Kern, R. Stereolithography versus milled three‐dimensional models: comparison of production method, indication, and accuracy, Comput. Aided Surg.1998, 5: 248‐56. Sarment, D.P., Sukovic, P. and Clinthorne, N.: “Accuracy of implant placement with a stereolithographic surgical guide”, Int. J. Oral Maxillofac Implants, 2003, 4: 571‐7. R.van Noort: The future of dental devices is digital, Dent Mater, 2012,1; 3-12 22- Williams, J.M., Adewunmi, A., Schek, R.M., Flanagan, C.L., Krebsbach, P.H., Feinberg, S.E., Hollister, S.J. and Das, S. :“Bone tissue engineering using polycaprolactone scaffolds fabricated via selective laser sintering”, Biomaterials, 2005, 23: 4817‐27. Petzold, R., Zeilhofer, H.F. and Kalender, W.A., “Rapid protyping technology in medicine – basics and applications”, Comput. Med. Imaging Graph, 1999, 5: 277‐84. Tan, K.H., Chua, C.K., Leong, K.F., Cheah, C.M., Cheang, P., Abu Bakar, M.S. and Cha, S.W., “Scaffold development using selective laser sintering of polyetheretherketone‐hydroxyapatite biocomposite blends”, Biomaterials, 2003, 18 : 3115‐23. Ning Gan, Yaye Ruan and Ting Jiao Comparison of adaptation between the major connectors fabricated from intraoral digital impressions and extraoral digital impressions, Scientific Reports ISSN 2045-2322 (Online). Etman M K ,Bikey D .Clinical performance of removable partial dentures: A retrospective clinical study. O. J. St .2012, 2: 173-181. G. Davidowitz, P.G. Kotick, The use of CAD/CAM in dentistry .Dent. Clin. of N. Am. 2011, 55: 559-570. Kim SY, Kim MJ, Han JS, Yeo IS, Lim YJ, Kwon HB. Accuracy of dies captured by an intraoral digital impression system using parallel confocal imaging. Int J Prosthodont. 2013, 26: 161-163. Feng Hu, Zhenhua Pei and Ying Wen. Using Intraoral Scanning Technology for Three-Dimensional Printing of Kennedy Class I Removable Partial Denture Metal Framework: A Clinical Report. J. Prosthodont .2017, 69:1–4. Jiang Wu, Xiaobo Wang, Xianghui Zhao, Chunbao Zhang, Bo Gao, A study on the fabrication method of removable partial denture framework by computer‐aided design and rapid prototyping", Rapid Prototyp. J., 2012 18: 318-323. Wataha, J. C. and R. L. Messer. Casting alloys, Dent.l Clin. N. Am., 2004, 2. 499–512.